Craving healthy lunch ideas? 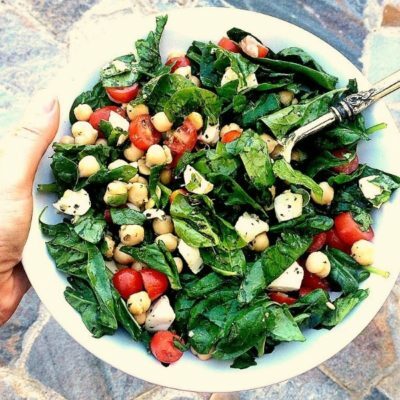 I’ve got you covered with 25 nourishing & delicious recipes, including this quick and easy Spinach, Mozzarella, Tomato and Chickpea Salad that will energize you all afternoon long! Because I know you’ve got work to do. 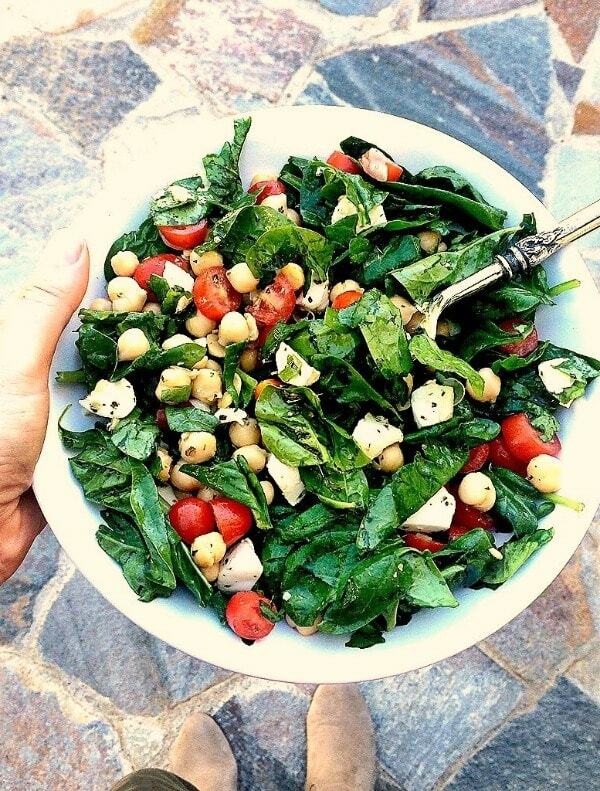 Which is why I’m sharing this delicious QUICK & EASY Spinach, Mozzarella, Tomato, and Chickpea Salad courtesy of the American Diabetes Association’s #HealthyLunchDay campaign which aims to promote the importance of healthier lunch habits not only on November 17, but every day of the year! Think balance! Choose foods & ingredients that provide a balance of protein, fiber-packed complex carbohydrates, and healthy fats to help energize you all afternoon long. Portion size matters. Unless you have the opportunity to take an afternoon siesta, I find keeping portions to a modest size, also helps to keep your blood sugar balanced so you don’t come crashing down right after lunch. Embrace leftovers. Pair last night’s dinner with a side of raw veggies, a piece of fresh fruit, or a side of Greek yogurt, and you’re good to go. Craving healthy lunch ideas? 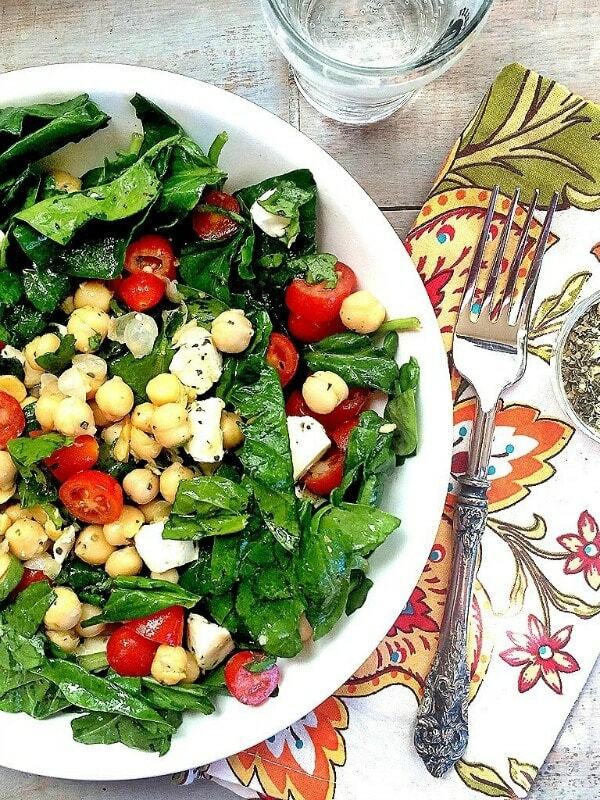 This Quick & Easy Spinach, Mozzarella, Tomato, & Chickpea Salad, will keep you energized all afternoon long! Combine mozzarella balls*, tomatoes, and chickpeas in a medium bowl. Add olive oil, balsamic vinegar, salt and pepper, plus optional oregano if desired. Divide spinach into 2 or 4 plates, top with mozzarella, tomato, and chickpea mixture. Vegan Option: Omit the mozzarella cheese and top with 2 tablespoons pine nuts or other nuts or seeds. And, here are more healthy lunch ideas I think you’re going to love! Note: Thank you so much to the American Diabetes Association for shipping me a #MyHealthyLunch kit so I can share this delicious salad with all of you, and help spread the work about #HealthyLunchDay. 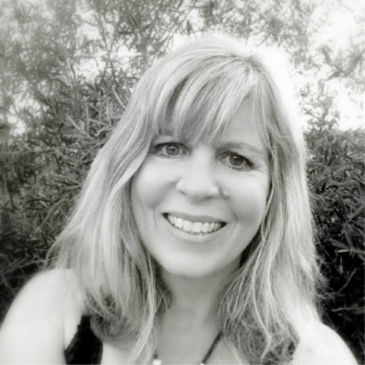 I was not compensated to write this post, but I am thrilled to partner with other health organizations and healthy living bloggers to help spread the word that healthy is delicious! Do you have any quick, easy, healthy lunch ideas of your own? Please share!! This is right up my alley – these days I need quick and healthy meals I can take to work in a hurry. Love it! Thanks so much Kristi! “Hurry” is my middle name these days too 🙂 Enjoy! This looks great! I love the tip about cutting up those tomatoes to evenly distribute throughout the salad :). I’ll have to remember that!